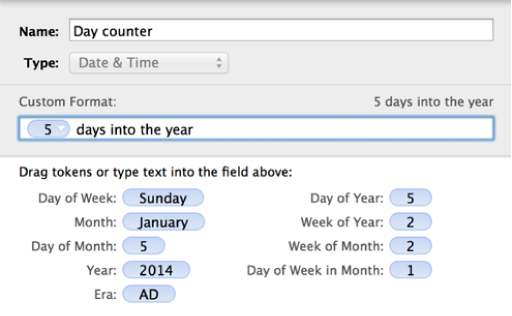 You can create your own cell formats for displaying numbers, text, and date and time values. Your custom formats are listed in the Data Format pop-up menu so you can use them again. Select a cell or a range of cells you want the format to apply to, then in the Cell pane of the Format inspector, choose Create Custom Format from the Data Format pop-up menu. Type a name for your format, then choose Number from the Type pop-up menu. 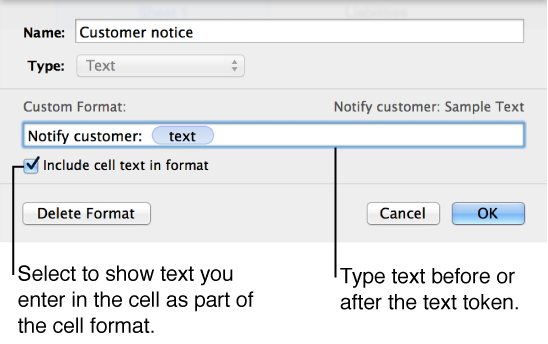 Type text in the field. The text you type appears in the cell. Drag tokens to the custom format field. A token represents the type of information you will enter in a cell. For example, if you’re entering US zip codes into a custom format, you can use an integer token with five digits. You can also drag tokens within the field to rearrange them. Customize a token element. 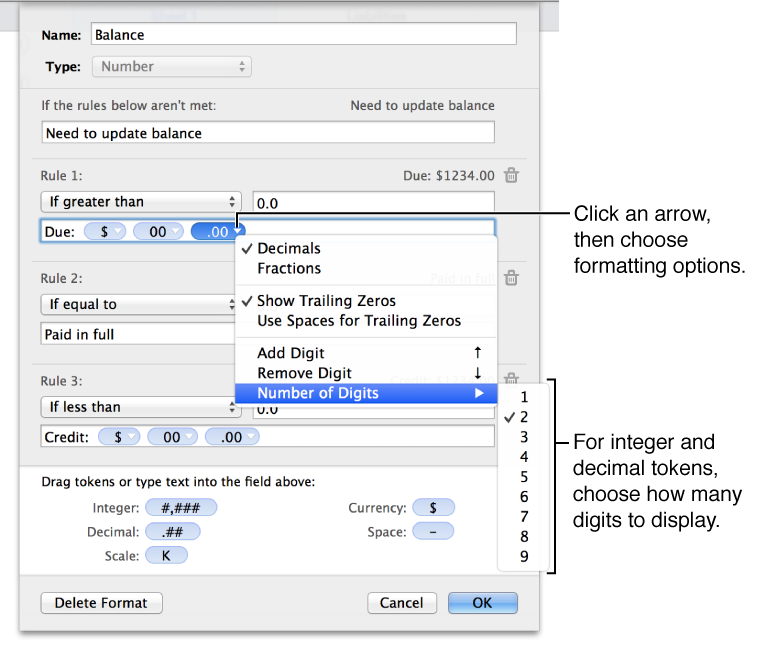 Click the arrow on a token to show formatting options, such as the type of currency symbol or the number of digits to display. Add up to three rules to format a cell differently based on specific conditions you define. Select a cell or a range of cells, then in the Cell pane of the Format inspector, choose Create Custom Format from the Data Format pop-up menu. Type a name for your format, then choose Date & Time from the Type pop-up menu. Drag tokens to the custom format field. A token represents the type of information you will enter in a cell. Customize a token element. Click the arrow on a token to show formatting options for the data. Type a name for your format, then choose Text from the Type pop-up menu. 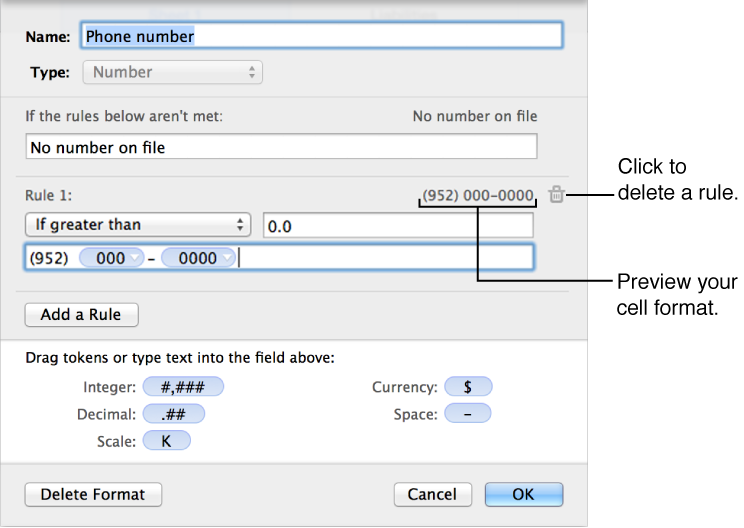 In the text field, type text you want to appear automatically in each cell that uses this format. The blue “text” token represents the text that you type in the table cell.